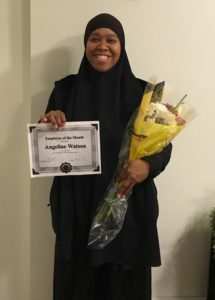 Please join us in congratulating Angeline Watson on being our Employee of the Month!!! Each one of our clients comes to us with specific needs and their own story. Angeline is an excellent example of a perfect caregiver match! Her unique talents and experiences allow her to be a wonderful caregiver for her client. Angeline not only adds wonderful things to her client life, but she plays a significant role in assisting the family. Every day that she goes to work, she brings a caring attitude and a positive spirit! We are so proud to have Angeline be a part of our Shine Bright Care team. In reflecting on this journey, my home care career, I cannot help but think of my parents. I assisted alongside my sister, to care for them during their last years. Both mother and father had suffered a stroke, heart attacks, diabetes, dementia, hypertension and many more complications that I cannot even imagine going through. Life as a caregiver was not easy but it was something that you just had to do, especially for your parents. Both my parents needed full-time 24-7 care, meaning they could not do anything for themselves. Every day my sister would care for them, whether it was assisting them to medical appointments, cooking and cleaning, bathing and showering, or transferring from wheelchair to bed. It was their complete care for all activities of daily living. I think of my parents often. My father passed in 2012 and my mother recently passed in 2015. I would give anything to have them back. That would be selfish to say, as it would have meant them suffering and not living a full life. I know they are in heaven smiling down. With the experience of caring for my parents, I was able to secure a job as a direct support professional. I was later offered a job as a case manager and excelled to become a team leader. Gradually I was promoted to being a care coordinator and from then on, I just knew this was meant for me. This is my calling; this is my life’s purpose. I went on to experience greater things in this field of Human Services. To care and help individuals and families find support and services needed to navigate the system to meet their needs, is such an honor and rewarding experience to be involved in. I look back, and a decade has passed since I started and it is now 2017. I would love to thank my parents for giving me the opportunity to have the experience of caring for them and go on to do something great with helping others find care and support in the community. Shine Bright Care Introduces the "Day Hab" Program! Shine Bright Care, LLC is proud to announce our membership to the FFTA.